A photographic record. 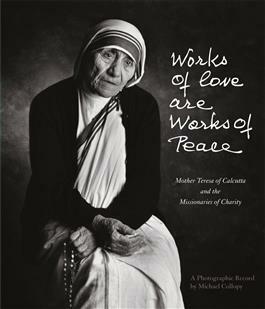 More than four years in the making and published with the permission and cooperation of Mother Teresa of Calcutta, this large format 224 page book offers the most comprehensive photographic documentation of the apostolic work and prayer life of the Missionaries of Charity yet published. Destined to serve as an important historical record, this "illustrated prayer book" vividly portrays the peace and joy that can come when "small things" are done with great love. The more than 180 fine art quality tri-tone photographs, along with spiritual counsel from Mother Teresa, will provide a lifetime of rich material for prayer and meditation. Included and published for the first time ever, with Mother Teresa's special permission, is an appendix containing the contents of the Missionaries of Charity daily prayer book as well as a most personal and profound letter on the interior life written by Mother Teresa during Holy Week of 1993 and addressed to her entire order. Though meant originally as an instruction and appeal to those in her order, this "I Thirst" letter is certain to become a source of spiritual light and encouragement, drawing innumerable hearts and souls closer to God. Michael Collopy is one of the preeminent portrait photographers of our time, well known for his commissioned portraits of a variety of world figures ranging from Mikhail Gorbachev and Margaret Thatcher to Frank Sinatra and Placido Domingo. A student of such luminaries as Ansel Adams and Richard Avedon, Collopy's work has been published in books, magazines, newspapers, and on record and CD covers worldwide. 187 fine art, high quality, original tri-tone photos. Previously unpublished private prayers of the Missionaries of Charity. Mother's profound, personal "I Thirst" letter on prayer never before published. Other quotes and spiritual counsel from Mother Teresa. The ideal gift book as a lasting keep-sake.